2018 marks the 11th consecutive year that Gartner has recognized Microsoft as a leader in "Analytics and Business Intelligence Platforms." This is largely due to Microsoft Power BI (business intelligence), a suite of tools that provides data-driven insights both internally and client-side. 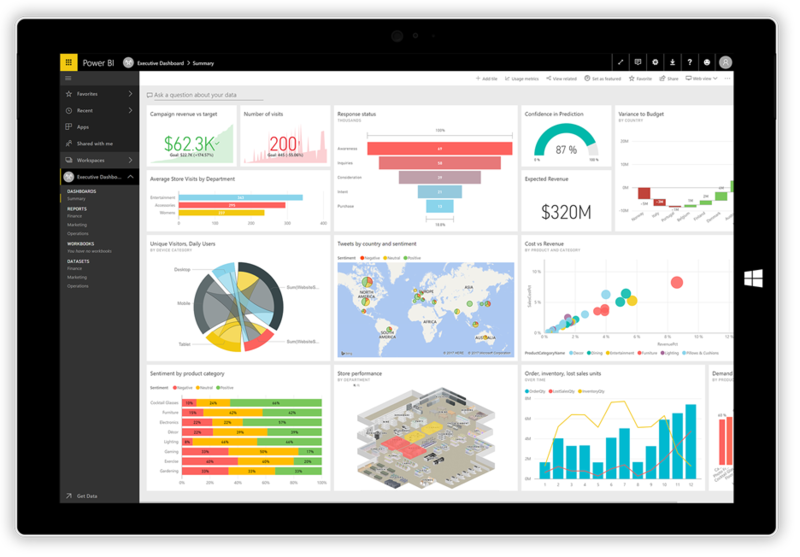 Power BI incorporates data preparation, discovery, interactive dashboards, and augmented analytics into a single, intuitive channel. This range is integral to Power BI's key tenet - making your data work for you. By supporting a productive, diverse data culture, Power BI empowers employees to better understand and utilize the information at their disposal. Data sources can be either on-premises, in the cloud, or hybridized. This simplified approach allows for ad hoc analysis, dependent upon user need. The dashboards are live, tracking and reflecting the most recent data. The same goes for alterations made by team members. Power BI immediately notifies all members when a change has been made to a shared project. And through the Power BI Mobile App, users can access their data and reports from anywhere, on any device. When looking at "Ease of Use and Visual Appeal," Gartner reported: "Microsoft's customer reference scores place it in the top quartile... There are a number of features within the product that contribute to its overall ease of use, including its primarily cloud deployment model. Microsoft was early to the industry in terms of a natural language/search interface with Microsoft Q&A". All visualizations are pinned to the dashboard. After finalization, these reports can be published for your organization on the web. Power BI also allows users to create mobile-optimized reports for viewers on the go, ensuring continuity across devices. 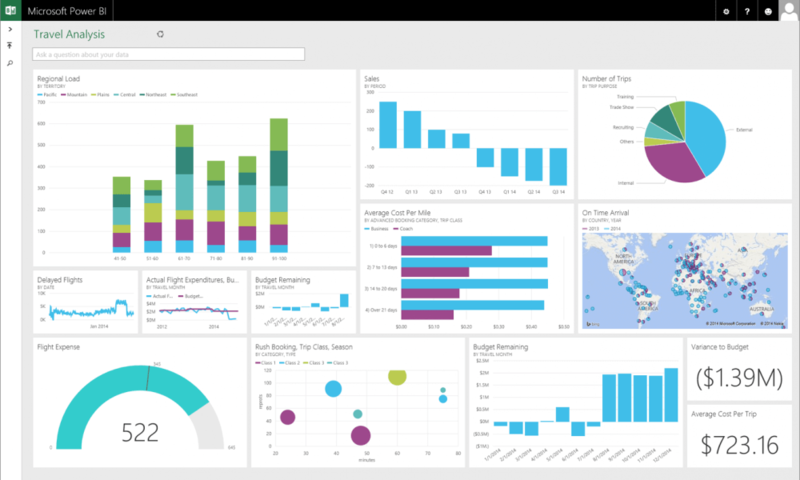 In their assessment of Power BI's offerings, PC Magazine wrote "giving information a fresh perspective can be extremely valuable and is a core part of the self-service BI value proposition: more people looking at more and different data in new ways... Telling a data story visually." Because Power BI is part of Microsoft's cloud platform, the service is fortified with a number of security features. Power BI uses Azure Active Directory to store and manage user identities, authenticate logins, and cross check credentials. While user dashboards are cached in Power BI, access to the integrated data sets or reports requires further authentication. Power BI tracks how data is being used, who is accessing it, and on which devices. Furthermore, Power BI also uses Active Directory to securely manage the storage of data in Azure BLOB storage, or metadata in the SQL database. Again, Power BI tracks anomalies, usage, and access, to ensure that all data is being secured. By monitoring policies and providing proactive support, Power BI positions businesses to meet all security, governance, and regulatory requirements. And the coverage is scalable, providing enterprise-wide support that will grow with your business. Tip: Azure Active Directory provides a one stop shop for cloud-based identity management. Read more about it here. In today's competitive market, can your business afford to underutilize the information at its disposal? Power BI allows your employees to optimize their insights, improving collaboration, efficiency, and long-term growth. Need help with a Power BI implementation? A technology partner such as iCorps can provide the critical expertise, and IT support you need to deliver on the Power BI promise - making your data work for you.